Steele Memorial Library will be open on Columbus Day (10/10/11) from 10AM-6PM. 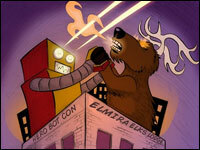 CCLD will be attending Hero Bot Con 2011, the Comic Convention for a Cause. The event will be held on Saturday, October 8th from 11am-6:30pm, at the Elmira Elks Lodge. Admission is Free with a donation of at least 1 canned food item (donations go to the Food Bank of the Southern Tier). The person who donates the most items will win a one-of-a-kind custom sketch by guest artist, Khoi Pham. Hero Bot Con has an impressive list of well-known artists appearing including: Mighty Avengers artist, Khoi Pham; Fly Guy author, Tedd Arnold; Armory Wars illustrator, Aaron Kuder; Simpsons comic inker, Ken Wheaton; The Stuff of Legend artist, Charles Paul Wilson III; and T.A.I.L.S. creator, Andy Wales. The convention will also feature a variety of independent comic creators, graphic artists and illustrators. Become a superhero and join in the fight against hunger by attending Hero Bot Con. It is sure to be a day full of amazing art, great company, and fun memories. Visit our calendar of events for a complete list of CCLD events.